Accidents involving flatbed trucks can be particularly dangerous as tractor trailers and flatbed trucks can weigh more than 40 tons compared to passenger cars and trucks which average just 2.5 tons. Flatbed trucks’ large tires and the height of the deck of trailers both pose serious threats to the passengers of cars, trucks, motorcycles, and pedestrians. Negligence on the part of tractor trailer operator can lead to traumatic brain injuries, paralysis, broken bones, and even death. What are some causes of accidents involving trucks? There are a number of causes for accidents with large trucks including that loaded trucks can take up to 40 percent further to stop than a passenger vehicle. The stopping distance discrepancy is even more significant on wet and slippery roads. Another cause of accidents with large trucks is the limited visibility of drivers. Large trucks have many blind spots, especially on the passenger side of the vehicles, which can lead to crashes. To help protect yourself while passing a large truck trying to pass trucks from the left lane of the highway giving an operator a much better chance to see your car. The National Highway Traffic Safety Administration continually warns the public about the risks of driver fatigue, especially in truck drivers. Often truck drivers are paid by the mile, so there is an incentive for operators to drive hundreds of miles every day. Federal regulations limit the number of hours a truck driver can drive each day, but driver fatigue continues to be one of the most common causes of semi-truck accidents. Another common cause of motor vehicle crashes involving flatbed and semi-trucks is distracted driving. Attempting to use a cellphone, fiddling with the radio or typing an address into a GPS system, eating, drinking, talking to other passengers or engaging in are all forms of distracted driving, and they can lead to disastrous results. Just as passenger vehicles are required to carry minimum levels of insurance to protect those involved in a motor vehicle collision, flatbed trucks are also required to carry insurance. Because trucks have the potential to lead to serious injuries, fatalities and massive property damage, federal law requires interstate trucks to carry large amounts of insurance to protect both drivers and trucking companies. What kind of insurance do trucks need to carry? A commercial truck with a gross weight of 10,000 pounds or more, carry non-hazardous cargo, is required to have a minimum of $750,000 of liability insurance to cover injuries to people and damage to property. A commercial truck with a gross weight of 10,000 pounds or more, carrying HAZMAT (hazardous material), except for explosives, is required to have insurance coverage of $1,000,000. A commercial truck with a gross weight of 10,000 pounds, carrying HAZMAT cargo and/or explosives has to have $5,000,000 in coverage. Trucks with a gross weight of fewer than 10,000 pounds carrying non-hazardous cargo are required to carry $300,000 of coverage. Trucks with a gross weight of under 10,000 pound carrying HAZMAT goods of any kind are required to have insurance coverage of $5,000,000. In addition to the federal regulations above, most states also have laws in place requiring minimum coverage for commercial trucks. The settlement value of flatbed truck accident cases tends to be high because these vehicles can inflict a lot of damage. 2017, New York: $3,850,000 Settlement. A tractor-trailer driver is hauling a flatbed trailer on I-83. The driver wants to go to the shoulder of the road to address a potential concern his breaks. But he fears getting stuck so he chooses to go to the next exit and pull off into a parking lot. The next exit had a downward incline and as the rig approached the intersection at the bottom of the inclined exit ramp, the defendant realized that he had no brakes, forcing him to drive through the intersection with a red light. His breaks do fail and he hits a minivan broadside. The driver and the front seat passenger – both in their 70s – ultimately died (the passenger bled to death in the vehicle). The middle seat passenger, also in his 70s, survives the crash but suffers tears in both knees. All of the victims were Cambodian emigres. The crash is caught on video. The parties reach an out-of-court settlement before trial for a total of $3,875,000. The family of the minivan driver receives $2,050,000 and the family of the front seat passenger for the death of the minivan driver receives $ 1,650,000. The surviving passenger got $175,000 which was probably as much for his trauma as it was for his physical injuries. 2015, Maryland: $29,000 Verdict. This case has a twist because the flatbed driver is the plaintiff. This 50-year-old man is driving a flatbed truck off the I-270 ramp in Rockville. Hs is rear-ended at a stop light. He claims soft tissue neck and back injuries as a result of the impact. He claims $17,369.72 in medicals and $22,000 in lost wages. The jury does not by that getting rear-ended in a truck like that could cause that level of damage, particularly when there was no meaningful damage to the flatbed. 2014, Ohio: $500,000 Verdict. The defendant is driving an empty flatbed. He makes a U-turn on a divided highway in front of the plaintiff. Making matters worse, the flatbed is unlit and has no reflectors. The plaintiff has no real chance to avoid the crash She is airlifted to the hospital. While her hospital stay is only three days, she suffers a traumatic brain injury (TBI) that impacts her memory, cognition, balance, and speech. The defendant admits fault but argued she her injuries are not as serious plaintiffs’ lawyer contends. The plaintiff wins — how could she not? — but the federal court jury only awarded $500,000. This is a light verdict for a TBI. What you should do if you are involved in a crash with a flatbed truck? If you have were injured as the result of a motor vehicle accident with a flatbed or semi-truck, it is imperative that you speak with an attorney at Miller & Zois where an attorney experienced in cases involving semi-trucks will handle your case. 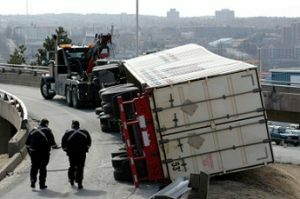 You need a truck accident lawyer with a history of big verdicts and settlements who will turn over every stone for you. If you have a case in Maryland and you want someone who knows the science of these cases and how to take them to trial, call 800-553-8082 or get a free online consultation here.